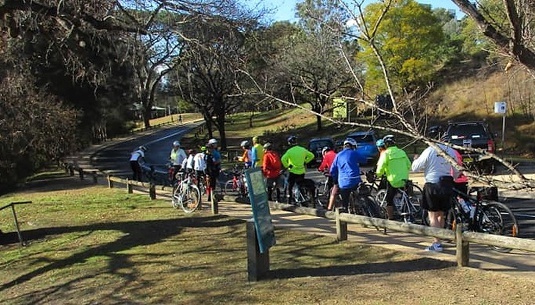 Summary : Ride along the PVC to Parramatta Park. Do a lap or two of the park before coffee, then return via M4 c/p. Suitability A good ride for beginners looking to go a little bit further. After leaving the Park we travel east directly through Parramatta City to a choice of coffee shops in the city or at the Parramatta Wharf, then some more back roads through Harris Park to join the M4 cycleway. This "cycleway with a roof" runs under then alongside the M4 motorway and provides a low stress route back to Homebush. The ride may choose one of two ways back to the beginning. The first is to follow the cycleways all the way back to Sydney Olympic Park where a long deviation to the river's edge and than around the shore of Homebush Bay ensures that the full distance is covered. The second route heads north through the back streets of Silverwater to cross Silverwater Bridge and reverse the route to the starting point. The ride normally takes about 3 and a half hours at a steady pace. The PVC route has gradually been upgraded over many years by both Ryde Council and Parramatta Council using grant funding. The goal is to provide a series of off-road cycleways all the way into Parramatta Park. Currently the only uncompleted section is between Wilde Ave and Parramatta Park.